Election Day at the Republican headquarters finished Tuesday with an eerie uncertainty: Well after midnight, the governor’s race was too close to call. Joyous GOP House and Senate candidates trickled out of the Sheraton Burlington Hotel and Conference Center after picking up at least eight seats in the state Legislature. It’s the first time the Republican Party has gained ground in the Statehouse in 14 years. And as expected, Lt. Gov. Phil Scott handily won re-election. But it was 11:30 p.m. before a tired-looking Gov. Peter Shumlin took the stage across town to thank voters — a speech noticeably absent of a victory cry. With 84 percent of the vote reported at 1 a.m., Shumlin had 83,430 votes (46.32 percent) to Republican Scott Milne’s 81,380 (45.18 percent). At the Republican headquarters, Milne also gave a speech, but stopped short of admitting defeat. Instead, Milne huddled with his daughter and son, who ran his campaign, clutching a printout showing that he was just 2,600 votes behind Shumlin, the two-term incumbent Democrat. “I’m a betting man but I’m not betting on this one,” Milne said. He left the hotel with his children a few minutes after midnight. Milne ran a campaign marked by rookie mistakes and gaffes that hurt his ability to capitalize on Shumlin’s vulnerability, making Tuesday’s neck-and-neck race that much more remarkable. Earlier in the day, Milne stood on a traffic island in the center of Barre, the city where he spent much of his childhood. “I’m pretty optimistic I’ll be governor,” Milne said on the traffic island. He also said he would be satisfied if he lost and returned to running the travel business his mother started 39 years ago. Milne seemed more comfortable on that traffic island, shaking hands with neighbors and waving at people he knew in cars as they passed, honking, than he did in the Sheraton grand ballroom. He began his speech at the Sheraton with a confusing joke. He went on to thank his family for their help in his campaign. “Thank you from the bottom of my heart for all of you who have stepped forward,” he said. Milne said the only regret of his campaign was that his mother, the late Marion Milne, was not with him on Tuesday. She died shortly after Milne’s nomination. 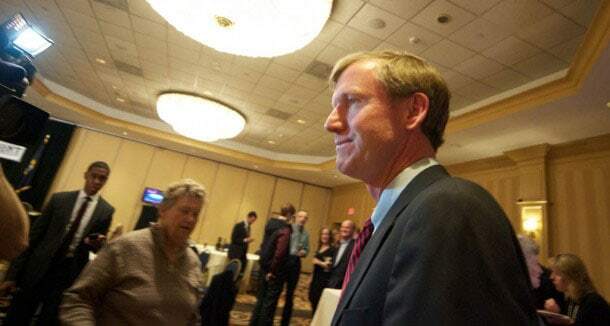 Milne was thrilled that he came so close to beating Shumlin, who had four times more money and decades of campaign experience. Milne comes from a family of politicos but this was his first statewide run. His campaign was criticized during much of the election because he did not offer a concrete policy platform, but he picked up steam in the two weeks before the election. “I was in this because I thought I could win and I think Vermont would have been a lot better off if I did win,” he said. Milne was dramatically outspent by Shumlin. The Republican spent $211,106 to Shumlin’s $890,312, and Milne contributed more than $50,000 of his own money. New to campaigning, Milne underestimated the importance of asking people for large sums of money, he said. Milne was a latecomer to the race, expressing interest weeks before the filing deadline when other candidates pulled out and party leaders feared they would be without a candidate for the state’s highest office. Milne said his candidacy forced Shumlin to discuss issues that frustrate Vermonters, such as high property taxes and the problems with the governor’s health care reform efforts, including Vermont Health Connect. “The discussion has been healthy for Vermont,” he said. GOP party chairman David Sunderland said whatever exact vote count emerges Wednesday, voters clearly signaled a dislike for the Shumlin administration. “I think the interesting part of the story is that a two-term incumbent Democratic governor in Vermont is going to get less than 50 percent of the vote,” Sunderland said. Republican candidate for governor Scott Milne arrives at the Sheraton Burlington Hotel and Conference Center in South Burlington on election night.